Walt Disney vitabu - Aladin 2: The Return of Jafar. Walt Disney Book Image of Abis Mal, Jafar, The Sultan, Princess Jasmine, Iago and Prince Aladin from the Walt Disney Book "Aladdin 2: The Return of Jafar" (1995). 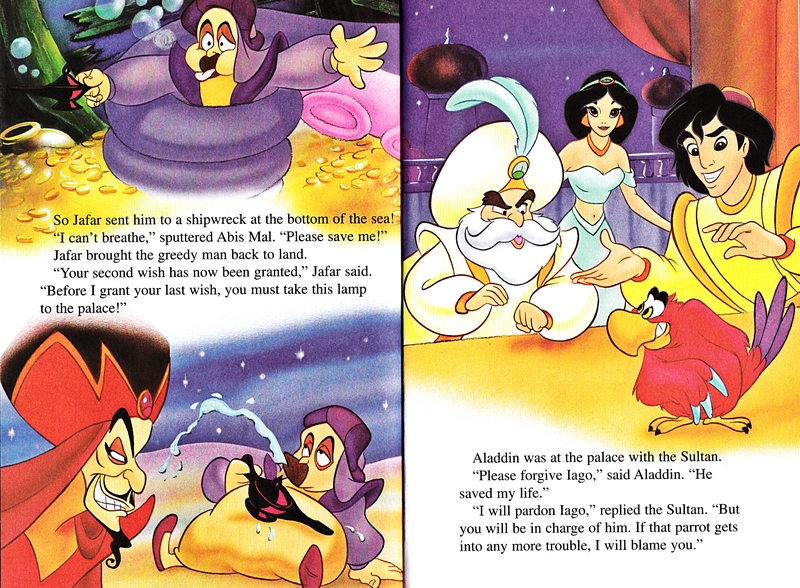 HD Wallpaper and background images in the Walt Disney Characters club tagged: walt disney characters walt disney books walt disney book images aladdin 2: the return of jafar abis mal jafar the sultan princess jasmine iago prince aladdin pruefever. This Walt Disney Characters photo might contain anime, comic kitabu, manga, cartoon, and mkono.